Another day, another meal to be eaten, another catch up to be had. This time I was meeting my friend who works for a well known online retailer, to collect my discounted snow boots for my skiing holiday in March (Christmas present from the boyf – I know, exceeded himself). Alas the boots were left at home amid a flurry of phone in the loo antics but of course this was only an excuse for our real need to talk crap for hours and eat mountains of food. Horribly hungover from the previous night at Hawker House (read post on it here) I dragged my sickly behind out of bed and over to King Cross for 1pm. We’d chosen Caravan on whim really – I didn’t even know much about their original Exmouth Market site. It was just the last time we’d met we’d had such an amazing experience at The Riding House Cafe (yup, there’s a post for that too, here) that we wanted to see if we could strike it lucky twice in a row and Caravan, judging by the menu, seemed a likely place to do that. 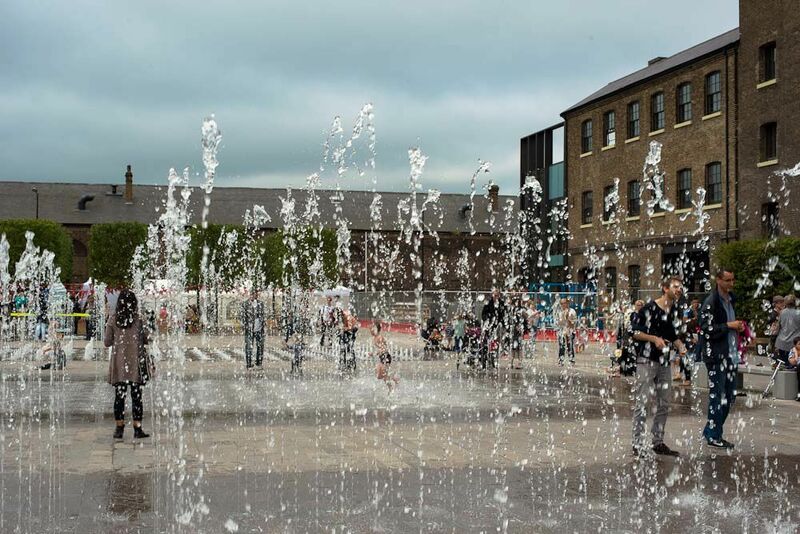 Caravan is situated on Granary Square which is, for those who know London, right on Regent’s Canal and also where the new Central St Martins university of Arts site is. The whole area is part of a huge gentrification project and as you stroll over from Kings Cross there’s a lorra lorra scaffolding to behold as well as the world’s crappiest viewing platform (which points out a student accommodation building woo!) The actual building itself is an old…you guessed it…grain store and is very industrial and, well, big. 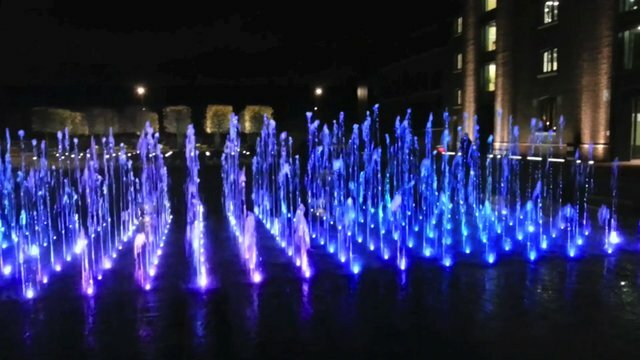 As we walked over we hopped and skipped through the fountains outside which are a nice touch – even more so at night when they’re all lit up. We heaved the weighty door open and joined the queue to request a table. Sadly we were told it would be a 45 minute wait but decided to put are names down anyway and order a coffee to sit outside with. A long chat and a little text later (from the reservations people) we were showed to a table for two and given the brunch menu. I decided to order Baked eggs with tomato pepper ragout, Greek yoghurt, chorizo sausage and grain toast whilst my brunch buddy had Corn & morcilla (black pud – I know, we had to google it too) fritters, avocado and paprika crème fraiche. We both went alcoholic with one bloody mary and one peach bellini and our servers kept us topped up with jugs of tap water even replacing them when empty without having to be asked. 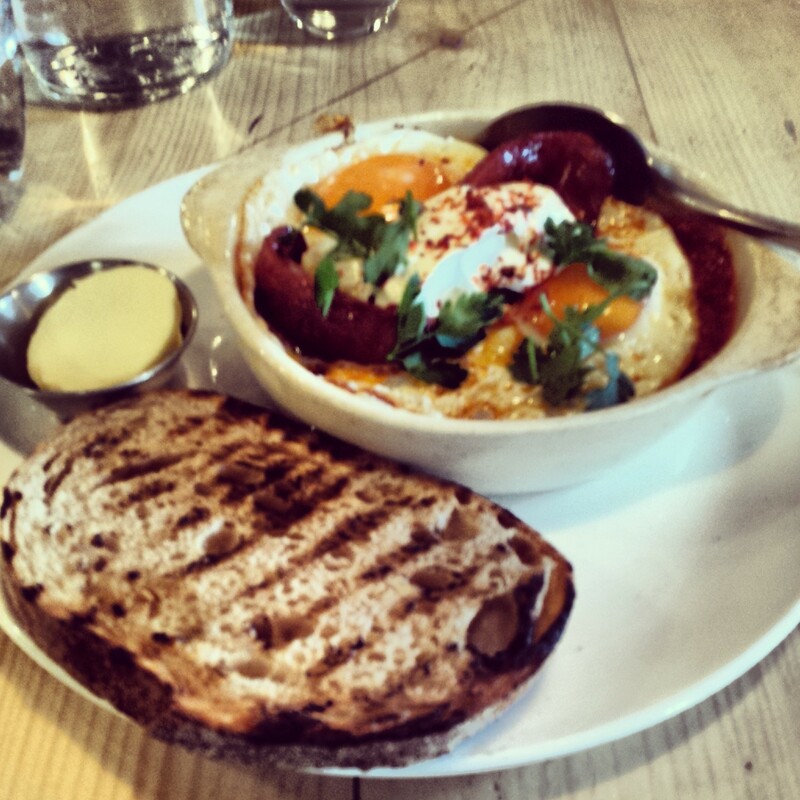 My dish was delish (I really need to find another word to describe food) – It came in a round pot with poached eggs sitting on the tomato base…the mixture of the tomato with the yolk, spicy chorizo and fresh yoghurt is something I could eat over and over. The only minor issue was the grain toast not being an exceptional aid in soaking up the leftover juices. Across the table there seemed to be similar delight. We sat for an age chatting away and not once felt hurried or rushed out and they did seem fairly busy. It was a relaxed and very easy going place to spend an afternoon. For me it seemed quite warm inside maybe that was because of my hangover, or perhaps because of the heating being on high however it would worry me for how warm it might be here in the summer months if I’m already sweating in January. 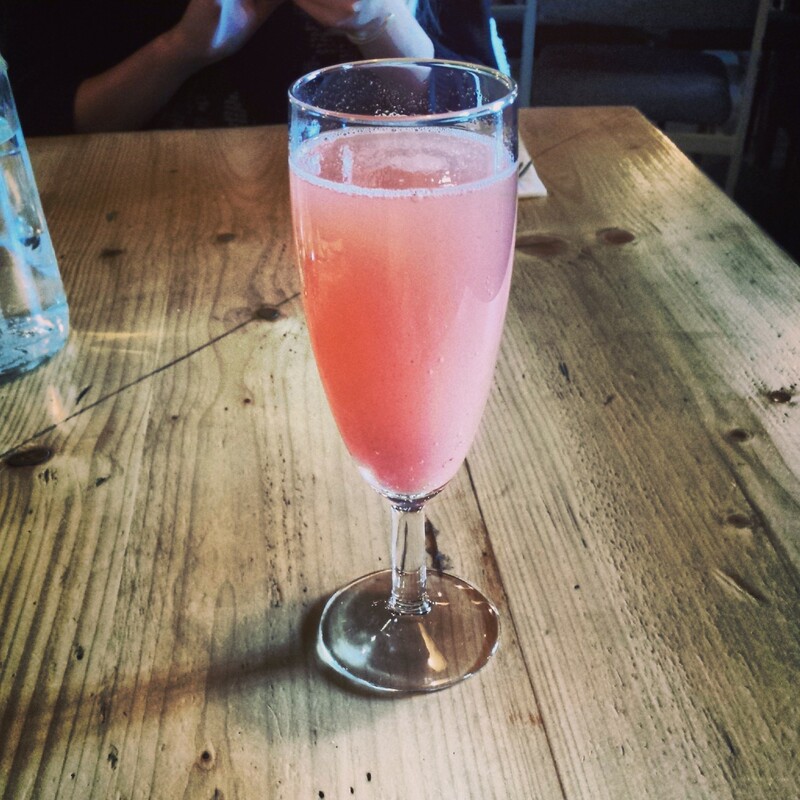 Overall I enjoyed brunching at Caravan. I’m not sure I would rush back but that’s through no fault of theirs. I think it’s just in a bit of a funny area…there’s not much else around from what we could see. Although perhaps in the summer when they show open air films on the canal right in front there may be a bit more a of draw. One thing I did find odd was the unisex toilets. Of course I’ve come across these in clubs but in a restaurant – it was odd. There were 4 cubicles, 2 for men and 2 for women and the women still seem to queue for their loos even when a male cubicle is free…which seems a bit ridiculous. If it’s unisex shouldn’t everyone just stand in the same queue for all 4 loos? Who knows. Anyway you can check out Caravan Kings Cross on the link below and also look at their original site on the link below that. Hawker (more like corker) House!! !